AmpliTube 4 is a worthy update. With the new 3D room, speaker and extended microphone modelling, it gives you a lot of bang for your buck. Loads of options. Good value. Lacks official models. Looper is a weak link. 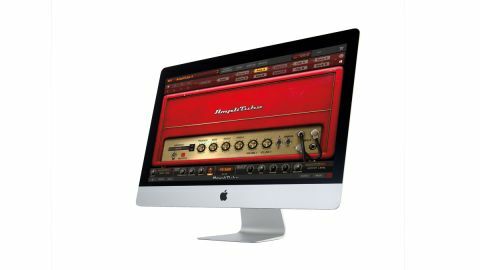 If you record guitar using a digital device, chances are you've heard of AmpliTube. For version 4, the interface has had something of a facelift, although like previous incarnations, it's still very intuitive. This new incarnation comes in two formats: the Deluxe version (as reviewed) is for players who don't already own AmpliTube, while the standard version (€149) adds the new features and models for existing users. Either way, IK's latest offers a load of extra flexibility over its predecessors. First off, effects routing has been revamped, so you can now use rack effects as stompboxes in front of amps or in effects loops for extra tweakability. But most notably, AmpliTube's cab modelling has seriously raised its game, with a 3D visual representation of six different live rooms, a host of industry standard microphones and a version of more or less every type of guitar speaker on the market. There's even a new mixer to blend the levels of the two cab mics, pan them, adjust the room ambience and width control of the mics, and even invert the phase of the three channels. This element genuinely gives you the feeling of being in a pro studio working on guitar tones, even if you're sat in front of your laptop in your pants! "Modelling is authentic both aesthetically and sonically." Other new features include a looper, and a sequencer that's much easier to use than before. The ability to multi-track and jam out ideas is a nice feature, but the looper is something of a weak link in the AmpliTube 4 chain. Without IK Multimedia's BlueBoard wireless MIDI controller or similar, it's nearly impossible to use, as the spacebar doubles as your record/play button - we struggled to get any usable results this way. Compared with similar setups from Logic Pro X, Guitar Rig 5 and Waves' GTR, AmpliTube seems to be geared more towards tone purists than more experimental players, and accordingly, the modelling is authentic both aesthetically and sonically. Yet although AmpliTube is famed for its licensed emulations of gear from Fender, Mesa/Boogie, Soldano, Orange et al, none of these official models are included in AmpliTube 4, which renders some of the software's presets somewhat lacking. Nonetheless, IK's own models do a great job, from the cleanest of funk rhythms with single coils, right through to super-high-gain lead/metal rhythm tones with humbuckers. You may not get the same effects-laden creative wackiness that can be achieved with Guitar Rig, but you can accurately emulate a lot of classic and contemporary gear here. While some may baulk at purchasing officially licensed models separately - the full Mesa/Boogie amp pack weighs in at €149.99 - this wide-ranging updatability is what continues to set AmpliTube apart from the crowd.